Since you are looking for great Saniflo toilet reviews, I guess you want to install it in a tight spot where normal toilet like TOTO won’t fit. Well, you are in the right place. I have summarized 6 upflush toilet reviews so that you can pick the right one. All of them that I have reviewed are proven to work without any trouble for a very long time. In total, there will be 6 Saniflo upflush toilet reviews. But from the following table, you can get a quick comparison of 3 most popular macerating toilets. It will save a lot of time. All the following reviews are based on users feedback. I did not go after many technical details. Instead, I tried to make you understand that you are not investing in something crap! If you are looking for a half-bathroom, this is the one you are probably looking for. Well, it’s a self-contained macerating toilet meaning it saves water and you can install it anywhere in the bathroom where other normal toilets can’t fit. Also, they are accessible by all, so if you have physically disabled family members in the home, they can use it as well. No concrete cutting required. You can install it anywhere you wish like upper/ground floor, loft/attic, and basement or even garage! That’s the true reason why people love it. It is not a traditional toilet. There is no traditional toilet tank. Because there is no tank, so it takes really small space but works like a powerful toilet. Let’s say you need a half-bathroom under the stairway or any other places where no traditional toilets won’t fit, SANICOMPACT is your ultimate choice. It’s fully automatic and using it is almost the same as any traditional toilet. When you are done, just press the push button and the flushing mechanism and the macerating pump will act automatically. Good To Know Fact: Do not flush anything other than the toilet paper with the solid/liquid waste. It will clog easily. Also, this type of toilet makes a little bit more noise than of their traditional kind. Don’t forget to connect the macerator to a GFI circuit. Proper installation is very important for the unit to work flawlessly. Read the manual very carefully before installation. Read as many macerating toilet reviews as you can. But for now, watch the official video demo of the SaniCOMPACT toilet. One piece toilet, installation is really easy. Built-in electric flushing mechanism. Floor mounted toilet, so literally you can install this toilet everywhere. Overall dimension of the toilet is 15.75” H x 14.5” W x 18.25” D.
If you are environment conscious, you will love it. Only one gallon is used per flush! Do you know what normal toilet uses per flush? At least 1.6 gallons! Powerful pump with 0.3 horsepower allows up to 6 ft. vertical and 100 ft. horizontal pumping. The pump is long-lasting and serviceable. It is expected that the pump will work for up to 30,000 flush cycles. Elongated shaped toilet with gravity assisted flushing mechanism. If you are afraid of the bad smell, please don’t. No one having experience reported having a bad smell from it. While users left their SANICOMPACT review, they’ve mentioned some problems as well that you need to be aware of. Poor installation guide. Watch some YouTube videos or hire a plumber for the installation. Let’s have another Saniflo macerating toilet reviews. Lots of people having various problems with basement toilets have found the ultimate solution installing the SaniPLUS system. If you have a washroom in your basement, you will love it. The powerful pump and toilet – all together will meet your expectations and serve you for a very long time. It’s already been serving a lot of people for some years without any trouble. And the noise level is fairly low. So, your investment is safe and the return is also great. The most amazing part of SaniPLUS is that the toilet accepts sink and shower drain. Literally, you don’t have to cut any concrete. That’s the reason the elongated shaped macerating upflush toilet is so much popular for people who have a tight spot for the bathroom. It may seem costly to you at first, but it actually saves your money and time since you don’t have to break your floor. And it’s possible because of the unique rear discharge of the toilet. It’s not a standard toilet like TOTO or anything; you should have it when no standard toilet can fulfill your requirement. 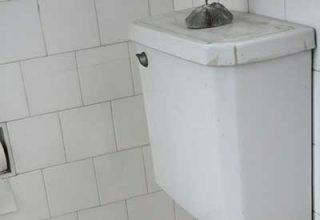 With the right set up and connections, the pump will discharge water waste from other sanitary fixtures like bidet, bath, and basin etc. Low noise. Pretty low than what you expect from such toilets. Great water saver. Only 1.6 Gallon Per Flush. Gorgeous white color to match your interior. Comes with the toilet bowl, tank, and the macerating bathroom pump. From the front edge of the toilet bowl to the back of the macerating pump, there is a distance of 27.5 inches. This is when the bowl is standard but if it is elongated, the distance will be approx. 29.5 inches deep. And if you want to know the weight of the toilet, it is about 99.7 pounds. Easy installation. Read the manual carefully. Watch some YouTube video tutorials to gain confidence. Very caring after sales support. There are some not so cool facts shared by experienced users in their Saniflo upflush toilet reviews. You should know them as well. 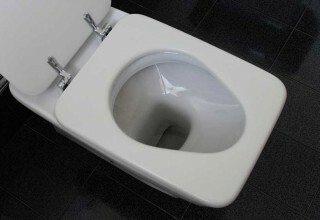 In very rare cases, the toilet seat does not align properly with the toilet bowl. Low water level in the bowl. So for no. 2 solid waste, you may need more than 1 flush. It will gonna be a small and quick Saniflo macerating toilet reviews, so sit tight. Once you professionally installed this, the outcome is great and it will exceed your expectations in every way. Already so many happy users and great recommendations from them. You will love the ergonomically designed toilet for its strong flushing capacity even though the water level in the bowl sits very low. The powerful pump is well hidden, so you should have no confusion whether it will look odd. It just looks fine and beautiful. Now, I will answer some very basic questions that you may have. It’s a very common question asked by lots. To be frank, macerating toilets are not as quiet as the standard toilets. But the noise level of the SaniACCESS toilet is very low, you won’t find it disturbing. How long will they serve? Saniflo stands behind their products. It’s an expensive kind of toilet, so you deserve better. Many have been using it for several years without any trouble. Good To Know: It needs to be vented. Since it has a drain side, there should be equal air-pressure on the vent. If you plan to use it to drain any sink or shower, make sure they are equally vented as well. Compatible with the USA electricity and the pipe fittings is also compatible with the USA standards as well. You will be in need of installing a GFI circuit though. Round toilet. As you have noticed, the previous 2 Saniflo upflush toilet reviews are about elongated shape, this is oval shaped. I have read lots of Saniflo reviews left by the experienced users to find some serious troubles. I could not find any such troubles, but some of them express that installing it is a little bit difficult. Especially, when you try to connect it to the vent pipe. Another macerating toilet reviews of Saniflo and this time it is for the complete bathroom solution. They call it the heavy duty toilet for several reasons. The great feature above all is that any sink, shower, bath, or washing machine can be hooked up to it. People are using it for a couple of years without facing any trouble. The grinding power the pump is just awesome. But still, you should not flush anything other than the liquid and solid waste with the toilet paper. Since you are looking for an upflush toilet system, probably you don’t have a choice for a normal toilet, right? Well, all I can say that it will do its job most effectively and it will serve you for a very long time. It comes with everything to have a perfect flushing toilet. Installation is fairly easy and there will be no bad smell. Definitely less noise as well but not less than the normal toilet. In fact, there will be almost double noise than any normal toilets. This video will help you understand it better. Elongated shaped while color macerating upflush toilet. There is a 16 ¾ inches distance between the top of the rim to the floor and 28 ½ inches distance from the front of the toilet bowl to the back of the tank. Comes with the toilet tank, bowl, and the pump. Powerful 1 HP macerating pump for the best grinding and pumping. Can pump 25 feet vertically! Can grind the solid waste most effectively to a slurry! Great water saver and waste disposal. Relatively low noise level and no smell. Make sure to connect it to the vent though. If you are having a bad smell, then the toilet is not properly vented out. Great support! It’s a high priced item so your investment needs to be secured. And Saniflo stands behind their macerating toilet. So, you can have it with confidence. Let’s check some cons to the Saniflo upflush toilet reviews so that you can understand what you may have to deal with. The macerating pump may not function properly in some rare cases. Well, you have nothing to worry about it. Just contact their customer support, explain your problem and they will take care of it. Not so great manual. Watch some YouTube videos as well. Have incidents of bad smell after a few months. Another great macerating upflush toilet from Saniflo. It does come with a toilet seat, bowl, and the toilet tank. A great macerating toilet to have when you have no option to install a normal toilet. 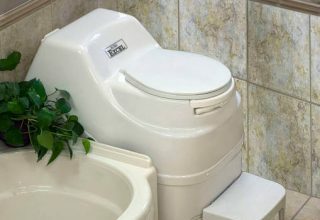 Just with a little assembly and installation, you can get a full-functioning macerating toilet that will work for a pretty long time. 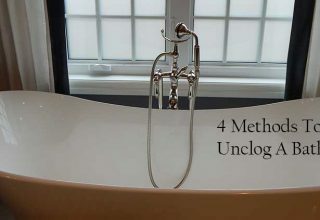 The cool thing about this one is you can connect it with your shower or tub, and vanity! No irritating bad smell and the noise level is relatively very low. Lots of people who have installed it in their basement or other places where no normal toilet installation is possible, have recommended it. Vital Tips: No matter what macerating toilet you use, chances of clogging is relatively high than normal toilet. This may happen even if you use high-end toilet paper. 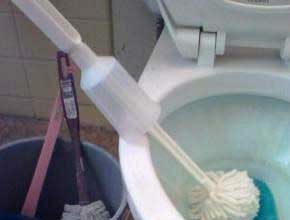 Fixing the problem with this toilet is relatively easy as you can clearly see what’s being clogged. Besides, if you notice the water level is relatively higher than normal, you can safely assume there is a clogging problem. It’s pretty easy to clean and all you have to do just unscrew the grinder and clean everything out. Don’t forget to vent the toilet to get rid of bad smell. And rest assured, the noise level is really low! This is the last Saniflo macerating toilet reviews and it will be very quick. This model from Saniflo is new to the market but got very high appreciation and recommendation from experienced users. 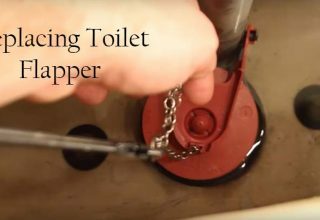 With a powerful grinding pump, the toilet can be an excellent choice for the flushing toilet in your basement. Lots of people have hooked up a shower, toilet, and sink to the unit and it has been serving for a long period of time. If you install it properly and vented out properly, there will be no bad smell and no blockage as well. But you are recommended to decalcify it once in every 6 months if you want to avoid the clogging issue. Installation is fairly easy as always and it comes with everything needed for a flushing toilet like toilet seat, tank, and bowl. If you don’t feel confident enough, please hire a professional plumber. Proper installation is very important for this type of toilets to get the best result. It’s expensive but the return is great. Besides, your investment is also safe as Saniflo take care of their customers. Even if you receive any damaged parts of the toilet, just contact their support center. They will take care of it. You have just completed reading Saniflo toilet reviews. I tried to disclose as much information as I can to help you out. Let me know if you need to know any more details about macerating toilets in the comment box. 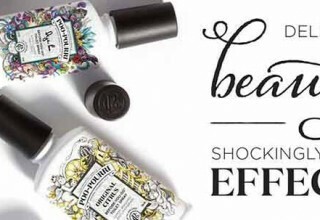 Next article DIY Home Project: How To Make Poo Pourri At Home?